The Gigaset N300A IP is an easy-to-configure hybrid DECT IP base station for both landline and VoIP calls – plus an answering machine. It supports up to 3 parallel calls, 6 different lines, and 6 compatible Gigaset handsets. With a maximum of 30 minutes of recording time, the answering machine ensures that all messages are received. And HD sound with HDSP technology means internet calls sound more like face-to-face conversations. ECO DECT’s energy-saving technology makes the Gigaset N300A IP an environmentally-friendly base station. The answering machine of the Gigaset N300A IP is full of convenient features for managing missed calls. Its 30 minutes of recording time ensures that all incoming messages are received and saved. Easily record conversations with the telephone call recording function. Also, the dates and times of messages are announced by voice, and users can play back messages remotely via the handset. All new message notifications get directed to the handset or to an external number via text message. Convenient operation of the answering machine is possible both on registered handsets and on the Gigaset N300A IP base station. Multi-line support allows up to three calls in parallel, in any combination of landline and online connections. Additionally, up to 6 compatible handsets can be registered to the base station, which also supports up to 6 different accounts / numbers. 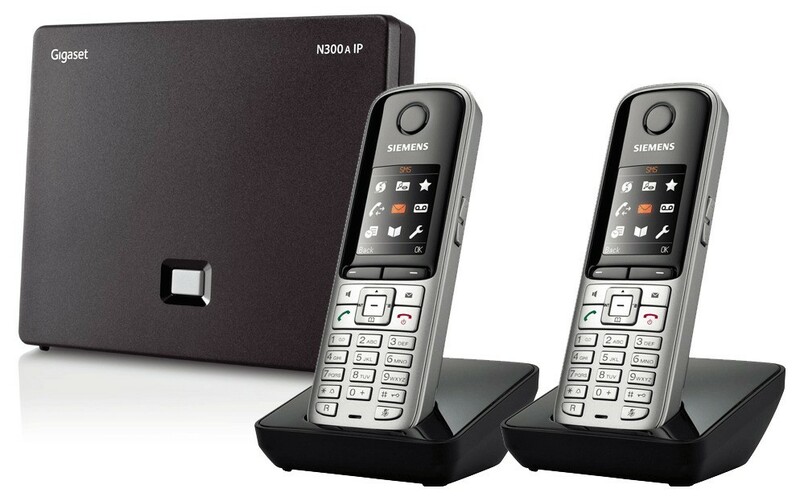 With internet calling, the Gigaset N300A IP truly raises the quality of telephony. All VoIP calls come in HD sound, thanks to Gigaset’s exceptional HDSP™¹ technology. And when IP calls are made to other Gigaset VoIP phones via Gigaset.net2, the call – to wherever in the world – is free. Use the Gigaset N300A with compatible Gigaset handsets for direct access to online information on the handset’s display. The email reader shows status quo of the user’s inbox and is updated as soon as new messages come in. Accessing people and businesses is easy via the online directories of various online phonebook providers. The energy-saving power supply of the Gigaset N300A IP consumes less electricity, so it’s kinder to the environment, and kinder to users’ wallets. Like all Gigaset base stations, it variably reduces the transmitting power from the handset to base station depending on their distance apart. Users can also reduce the transmitting power of the Gigaset N300A IP by 80% simply by selecting the ECO Mode on registered handsets. Furthermore, selecting radiation-free ECO Mode Plus on registered handsets turns off the transmitting power when the base station is in standby. The Siemens Gigaset S79h Additional Handset sets new standards for discriminating users. The new Gigaset phones are pleasant to hold from the very first moment thanks to their elegant form and unique real-metal keypad. A fantastic 1.8-inch TFT color display and clearly structured menu with an icon structure provide a quick overview of all the functions. The new phones’ outstanding voice quality is especially striking in handsfree operation. The volume can now also be adjusted during calls using a new rocker key on the side of the housing. The large address book with space for up to 500 entries and the mini-USB interface for quick and easy data synchronization.